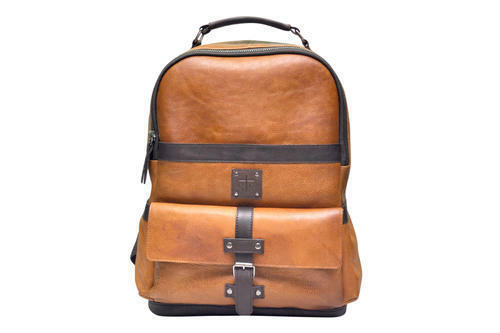 Backpack made out of cow natural dry milled leather.Well processed by following all export norms no harmfull or AZO dyes used. This is ideal for school, work and travelling. You can keep laptop, wallet, ipad, and other items. It has three compartments and two side pouches. Sastha Leather Crafts was incorporated in the year 2010 as a sole partnership entity at Chennai, Tamil Nadu, India. Widely acclaimed as a leading and prominent manufacturer, supplier and exporter of quality approved range of Leather Products, Leather Bags, Leather Handbags and Leather Purses. The firm has been regularly adding on new product designs as per client’s choice and acceptance. We offer Leather Passport Holders, Leather Menu Cards, Leather Folders, Ladies Leather Handbags, Side Leather Bags, Fancy Leather Purses and more. Our proprietor, Mrs. S. Jayalakshmi has excellent entrepreneur skills of running the business. She has remained totally devoted towards all the business activities right from purchase of raw materials to manufacture of products and till final delivery. We export our products to various countries of the world.